By Matt Rogers, Washington Post This Capital Weather Gang blog entry is written with considerable trepidation given the politically-charged atmosphere surrounding human-induced global warming. I am a meteorologist with a life-long weather fascination. As I’m sure you know, meteorology is an inexact science due to the large number of variables involved in predicting and understanding the weather. I frequently say that weather forecasting is a humbling endeavor, and I have learned to respect its challenges. From this perspective, you might be able to better understand why I wince when hearing pronouncements such as “the science is settled”, “the debate is over”, or even the “the temperature in the 2050s is projected to be…” I realize that forecasting climate and weather are different, but both involve a large number of moving parts. There are numerous reasons why I question the consensus view on human-induced climate change covered extensively on this blog by Andrew Freedman. But for this entry, I scaled them down to ten: (10) Hurricanes: One of the strongest value propositions presented for fighting global warming is to slow tropical cyclone intensity increases. Katrina was cited as a prime example. 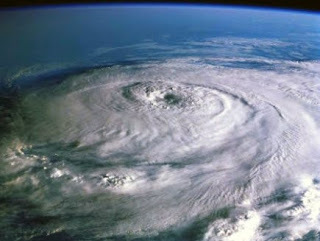 But the storm only made landfall as a category three (five being strongest) and affected a city built below sea level. Stronger storms have hit North America before, but the Katrina route and the weak levees made this situation much worse. 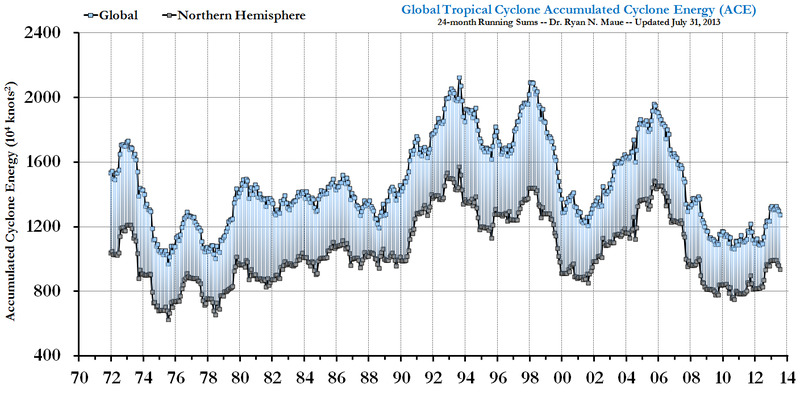 I follow global hurricane activity closely and earlier this summer, we reached a record low. Florida State has a site that tracks global hurricane activity here. Since the 1990s, this activity has been decreasing, which goes against what we were told to expect on a warming planet. (9) Ice Caps: In 2007, the Northern Hemisphere reached a record low in ice coverage and the Northwest Passage was opened. At that point, we were told melting was occurring faster than expected, and we needed to accelerate our efforts. What you were not told was that the data that triggered this record is only available back to the late 1970s. Prior to that, we did not have the satellite technology to measure areal ice extent. We know the Northwest Passage had been open before. In Antarctica, we had been told that a cooling of the continent was consistent with global climate models until a recent study announced the opposite was true. The lack of information and the inconsistencies do not offer confidence. (8) El Niño: This feature in the Tropical Pacific Ocean occurs when water temperatures are abnormally warm. Some climate change researchers predicted that global warming would create more and stronger El Niño events like the powerhouse of 1997-98. Indeed in 2006, esteemed climate scientist James Hansen, predicted this. But we are now about to complete an entire decade without a strong El Niño event (three occurred in the 1980s-1990s). So the more recent 2007 IPCC report backtracked from Hansen’s prediction, noting that there were too many uncertainties to understand how El Niño will behave with climate change. Recent research speaks to how important El Niño is to climate. In the past two decades, these warm El Niño and opposite cold La Niña events have accentuated the global temperature peaks and valleys highlighting the importance of natural variability and the limitations of the science. (7) Climate Models: To be blunt, the computer models that policy-makers are using to make key decisions failed to collectively inform us of the flat global land-sea temperatures seen in the 2000s (see more on this in item 5 below). The UN IPCC did offer fair warning of model inadequacies in their 2007 assessment. They mentioned a number of challenges, which is wholly reasonable since countless factors contribute to our global climate system–many of them not fully understood. My belief is that they are over-estimating anthropogenic (human) forcing influences and under-estimating natural variability (like the current cold-phase Pacific Decadal Oscillation and solar cycles). The chaos theory describes why it is far more difficult to project the future than climate scientists may realize (I give them a break here since climate modeling is in its relative infancy). We poor hapless meteorologists learned the chaos theory lesson long ago. (6) CO2 (Carbon Dioxide): The argument that the air we currently exhale is a bona fide pollutant due to potential impacts on climate change flummoxes me. CO2 is also plant food. Plants release oxygen for us, and we release CO2 for them. 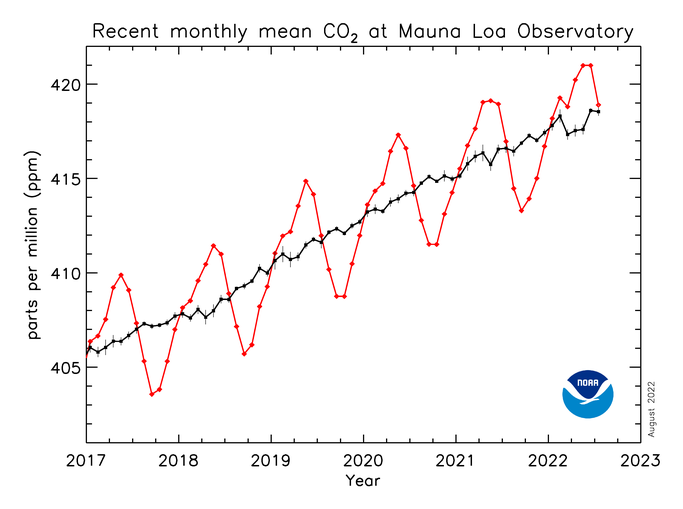 Over the summer, CO2 reached almost .04% of our total atmosphere as reported here. Because CO2 is but a sliver of our atmosphere, it is known as a “trace gas.” We all agree that it is increasing, but is there a chance that our estimate of its influence on the Greenhouse Effect is overblown given its small atmospheric ratio?